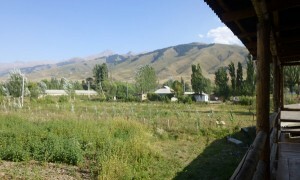 The bucolic Chong Kemin Valley lies about two hours drive from the metropolis of Bishkek. It’s the kind of meeting place “in nature” the Shamans and Sacred Site Guardians asked for, when I met them last year in Korea, at the World Conservation Congress. High peaks of the northern Tien Shan range rise above the valley, marking the Chong Kemin National Park, founded in 1977. Snow leopards live there, and are seen in the valley occasionally in winter. The Shamans were right; the work of saving snow leopards goes better in a beautiful place, especially one where the cats might be roaming the slopes high above. 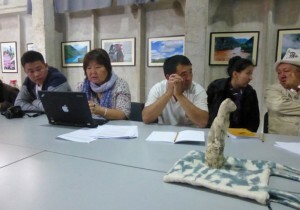 We called this workshop for mid-September, as a side meeting of the Global Snow Leopard Ecosystem Survival Forum. The Forum was called by the Krygyz government with the intent that it would happen concurrently with the Shanghai Cooperation Organization economic summit. The snow leopard range countries are Organization members, and their Heads of State would be attending, so it seemed like a good and logical opportunity to have a high level effort to set range-wide policies for snow leopard conservation. 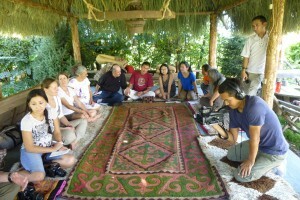 We were a group of twenty-one, including Indigenous Cultural Practitioners (ICPs) and their interpreters living and working in snow leopard habitat in Mongolia, Kyrgyzstan and the Buryat and Altai Republics of Russia. We use the term ICP to include Shamans, Healers, and Sacred Site Guardians. Since 2008, the Snow Leopard Conservancy has been working with the Worldwide Indigenous Science Network (WISN) towards a meaningful merger of Western and Indigen-ous Science, for the protection of sacred species. WISN was our partner in facilitating this workshop, with a generous grant from The Christensen Fund, and supplemental funding from the Indigenous Fund of the Tides Foundation. Kurbon Alamshev, from the Pamir Mountains of Tajikistan, is not an ICP; he is a long-time reporter for BBC who has recently become a champion of nature conservation. There is a significant dearth of books and articles in Tajikistan about conservation, and he wants to help spread the word about the Global Snow Leopard Conservation Forum and the ICP workshop. Mairamkul Asanaliev, Kyrgyz artist and scholar of traditional hunting, urged education in this modern society where trophy hunting has become a hobby of the rich done from helicopters with high-powered rifles. 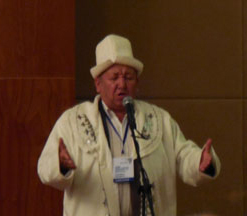 E. Buyanbadrakh, Shaman and Head of the Association for Protection of the Altai Cultural Heritage, echoed other ICPs in telling us that snow leopards were never referred to by name, but rather by a euphemism such as “the one with the beautiful coat.” To name snow leopard is to give it power to attack livestock. He does Shamanic ceremonies in many areas but feels most at home in snow leopard habitat. He believes Mongolian snow leopards can repopulate China and Siberia, where the cats have been heavily hunted. Slava Cheltuev, Shaman from the Altai Republic, said that snow leopard is a predator but knows “his” herds like a shepherd. He gave us a beautiful natural history of snow leopards from the indigenous perspective, and from his experience as a member of the Snow Leopard Clan and hereditary guardian of Irbis Tuu, the Snow Leopard Mountain. 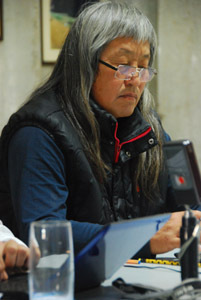 Those who hunt the snow leopard don’t get rich; more likely they get ill.
Norbu Lama is both Buddhist Lama and chairperson of the Association of Soyot Peoples. Norbu explained that the Sayan Mountains are sacred to the Soyots, and are also home to snow leopard, their main totem animal. The Soyots do ceremonies to honor the mountains. It was in these mountains where Chingyz Khan received his calling to unite the people. The power and energy of the land is still there, and we can use the landscape to awaken passion for preservation. The fate of many people is connected to the cultural landscape; understanding the land gives us the power to preserve it. Danil Mamyev,Guardian/Director of Uch Enmek National Park in the Altai Republic, has a degree in geology. He talked of how he came to realize that his scientific education threatened to override his indigenous education. He is an eloquent spokesperson for the integration of the two ways of knowing. Totemism, he said said, isn’t created by people—it exists. The ability to get knowledge from nature is a very big open book. There are places where people can get the knowledge without western education. Danil established the School of Spiritual Ecology-Tingri to preserve and promote the historical and cultural legacy and local traditions of the Altayan people. Zhaparkul Raiymkulov, Guardian of Arashan Ata Sacred Site in western Kyrgyzstan, opened our workshop with a ceremonial fire and invocation for success. Later, in his presentation, he said that in times past snow leopard purified humans’ environment and that is why it was forbidden to hunt, kill, or violate them in any way. He agreed with Mairamkul that education is needed, that modern society has lost its connection with nature. The ICPs and the Global Forum organizers have the same goals, but different viewpoints. Four of our group were young (30-something) Kyrgyz professionals who contributed greatly to the success of the workshop. Each came to us at the end of our week together to thank us, quite emotionally, for involving them in the workshop. They hadn’t heard of anything like this kind of gathering happening before. More than one said it was a life-changing experience; they have a new appreciation for their own deep culture. For Rodney and me, this was the best “unintended consequence” of having had the privilege of facilitating this workshop! The intended consequence was a Statement to the Global Forum, developed by the ICPs during a long brainstorming session at the end of the workshop. We, the indigenous cultural practitioners of the snow leopard range countries, welcome global efforts for the conservation of snow leopards and express our readiness to collaborate in the development and implementation of the comprehensive long-term Global Snow Leopard Conservation Program to meet goals of 2020 using our traditional knowledge. The Bishkek Declaration expressed strong concern about the increasing threats to our sacred animal that is “an irreplaceable symbol of our nation’s natural and cultural heritage and an indicator of the health and sustainability of mountain ecosystems” and called for “the enhancement of the role of local communities in snow leopard conservation efforts”. Representing indigenous and local communities of our respective countries we emphasize close ties between indigenous communities and communities of our totem animals. For us the state of the snow leopard is an indicator of the state of the spiritual and socio-cultural wellbeing of our communities today and of our future generations tomorrow. Indissoluble, enduring connection and mutual dependence of the fate of our Peoples from the fate of their totem animals is an indisputable truth for us. We understand that the risks and threats for the sacred snow leopard are augmented by the loss of traditional understanding and respect for the value of totem animals; we therefore are eager to unite our efforts with the efforts of our respective Governments, scientists and world community. Out of this sense of responsibility to our ancestors and our future generations, we indigenous cultural practitioners stress the central role of the snow leopard in survival of humanity facing civilization crisis, which is threatening our mountains with the cold breath of death. Snow leopards and other totem animals call us—through drastic change in their usual behavior—for spiritual renewal, for recognition and respect of the rights of Mother Nature. The snow leopard conservation measures cannot be limited just to the creation of new parks and protected territories. Conservation needs to be inclusive of the revival of cultural reverence and connectivity to these totem animals and strengthening of existing sacred sites. Today snow leopard range countries have a unique opportunity to create a system of snow leopard survival based on the spiritual and cultural resurgence of indigenous and local communities who share with this animal its habitat, i.e. revival of the large cultural landscapes and sacred sites. We, as indigenous cultural practitioners, are ready to strengthen educational, spiritual, and ceremonial ways to ensure return of respect to the snow leopard as an ambassador of Mother Nature. Indigenous and local communities are ready to take relevant actions to ensure sustainability of the snow leopard’s prey species by banning shooting in sacred places and by enhancing sustainable traditional hunting practices. We recognize the value of integration of our traditional knowledge with conservation science and are ready for cooperation. 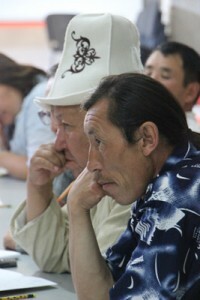 We call upon our Governments to enable active, full, and effective participation of indigenous and local communities, including cultural practitioners, in the development and implementation of local, national, regional, and global plans for conservation of snow leopard ecosystems through clear mechanisms of coordination, inclusion, and respect. On October 23, 2013, the Global Forum delegates met at the Kyrgyz State Residence, where the Global Initiative was endorsed by all twelve snow leopard range countries. Key participants and range country representatives were given a brief opportunity to address the Forum. Rodney Jackson read excerpts from the ICP Statement, and at the end of a long day, at the Forum’s request, Zhaparkul Raiymkulov performed a brief closing ceremony. This is was a historic opportunity both to bring Indigenous Cultural Practitioners together for the sake of snow leopards, and to have their voices directly heard in government level planning for conservation of these amazing wild cats.